Be a part of Oregon history! Renowned classical composer and philosopher, who lived in Agate Beach from 1941 to 1959, now has a wayside on Highway 101 dedicated in his honor. Take part in the making of the five ton, hand carved stone monument. $10 or more -- Thank you card and email invitation to dedication and related activities. $25 and above -- All of above and name on the "Making of the Monument" video and a link to the video. $50 and above -- All of the above, plus a DVD and recognition in special edition "Ernest Bloch: Composer in Nature's University." $100 and above -- All of the above, plus your name as a Silver donor. $500 and above -- All of the above, plus your name as a Gold donor. $1,000 and above -- All of the above, plus your name as a Platinum donor -- and your name etched into one of the three stone benches surrounding the monument. The Ernest Bloch Legacy Project, including its officers: Frank Geltner, Mark McConnell, Paul Brookhyser, Ramona Martin and Twylah Olson, has collected funds toward the creation of a fitting memorial to composer Ernest Bloch. It was decided to find a way to create a monument that would be "monumental" and pay tribute to the composer, who lived nearby from 1941 through 1959. 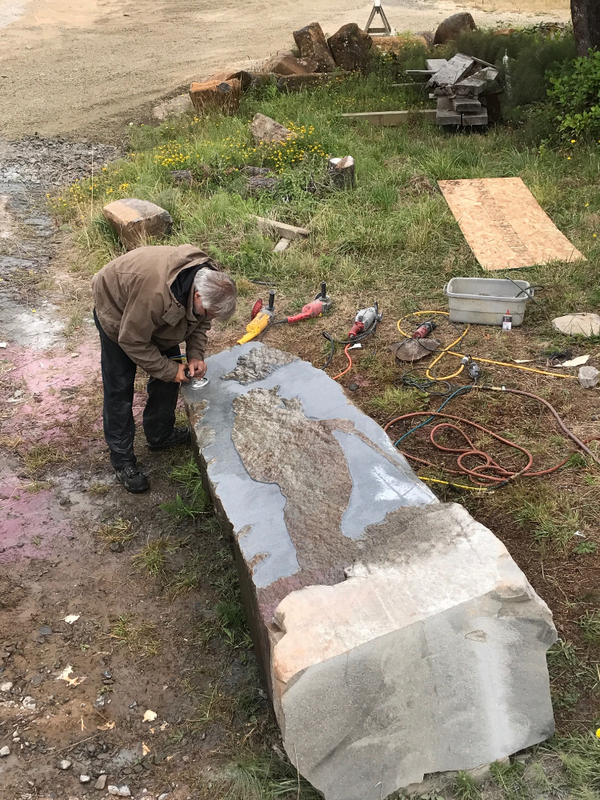 We found support from the folks at Road & Driveway Company and their Cedar Creek Quarries where they helped us locate a nearly 5 ton basalt rock. Sylvain Fremaux, former conductor of the Yaquina Orchestra (now the Newport Symphony Orchestra) was enlisted to help find an appropriate quotation from Ernest Bloch to include on the monument. Music, as well as other arts, ought to be an inherent part of our lives. Every human being is entitled to share its beauty. I hold it of first importance to write good, genuine music, my music. Spiritual values never die. The universal idea must prevail. This crucial idea has permeated all my life and most of my works. My ultimate faith and belief is in the unity of man, in spite of real racial values and dissimilarities. My faith is in justice on earth, on the right of each person to live life decently and usefully, giving to the community according to one’s gifts and forces. I had seen a house for sale overlooking the ocean on a high cliff, among pines, with flowers everywhere – absolute silence, except for the sounds of the sea. I need a sanctuary, a haven, to complete my life’s work. The City of Newport, supportive from the beginning, agreed to facilitate the siting and creation of the concrete pad which would support the monument. 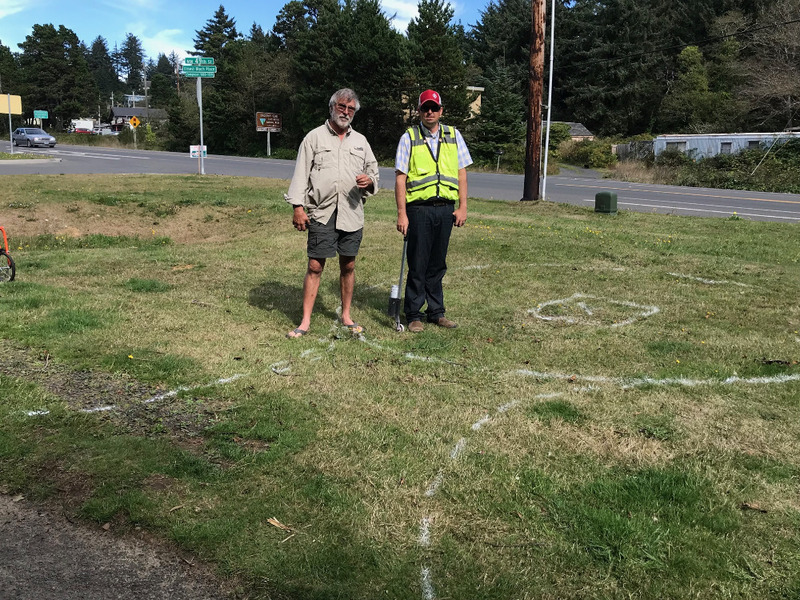 Here is a photo of artist Kelly Barker and City of Newport engineer Jayson Buchholz, marking the site in advance of bidding for the concrete work. In the background you can see Highway 101 and the street sign for "Ernest Bloch Place," a designation made by the Newport City Council in 2009 on the occasion of the 50th anniversary of Ernest Bloch's passing in 1959. The Ernest Bloch Foundation subsequently agreed to donate funds to the Ernest Bloch Legacy Project. The Lincoln County Historical Society agreed to serve as fiscal agent for the project. The Lincoln County Economic Development Alliance has agreed to fund the reprinting of the Ernest Bloch Booklet -- "Ernest Bloch: Composer in Nature's University." We wish to say thank you to Hunter Noack for including Newport and the Agate Beach Golf Course on September 13 in his IN A LANDSCAPE "Classic Music in the Wild" tour of the northwest to help call attention to the Ernest Bloch Memorial Wayside monument and dedication. The citizens of Newport, Lincoln County, the State of Oregon, the U.S., and many international communities will benefit from this important landmark in the community where Ernest Bloch and his wife, Marguerite, lived. It is the only home the Blochs ever owned in their lifetime. The funds we are seeking will be used to complete the Ernest Bloch Memorial Wayside Monument and the dedication; as well as the interpretive signage and literature for public distribution. We are hoping to complete this project by the Spring of 2018. Should sufficient funds be raised we also hope to schedule a major lecture, concert and dinner as part of the dedication. We would like to wrap up the campaign by the end of 2017, or early 2018. 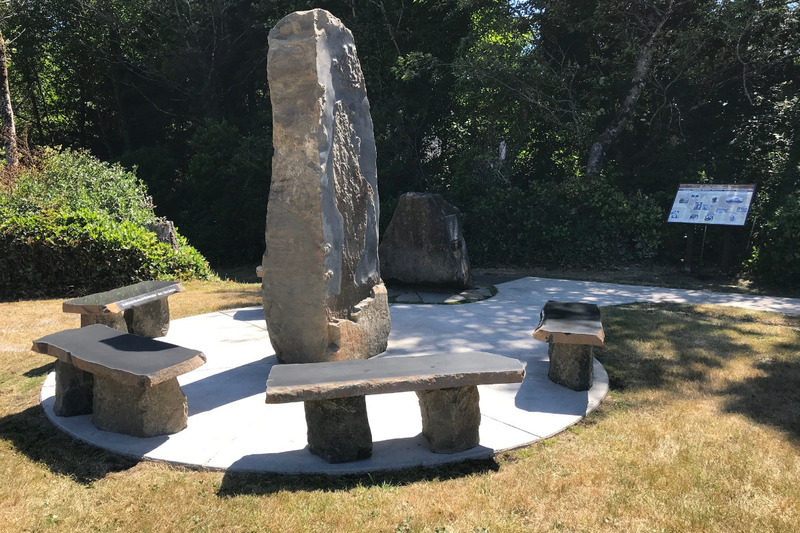 Thanks to all who donated in support of Ernest Bloch Place, the sculptural installation at the south end of the Ernest Bloch Memorial Wayside. This will be the final update prior to decommissioning this Go Fund Me page. The photo tells it all. We now have a destination, complete with an interpretive sign to tell the story of "Ernest Bloch: Composer in Nature's University," which is the name of our special booklet. If you don't already have a copy of the booklet, let me know by clicking on the "Contact Us" link at www.ernestbloch.org. We will see that you receive one. They are also available at Roby's Furniture and the Agate Beach Golf Course. Best wishes. 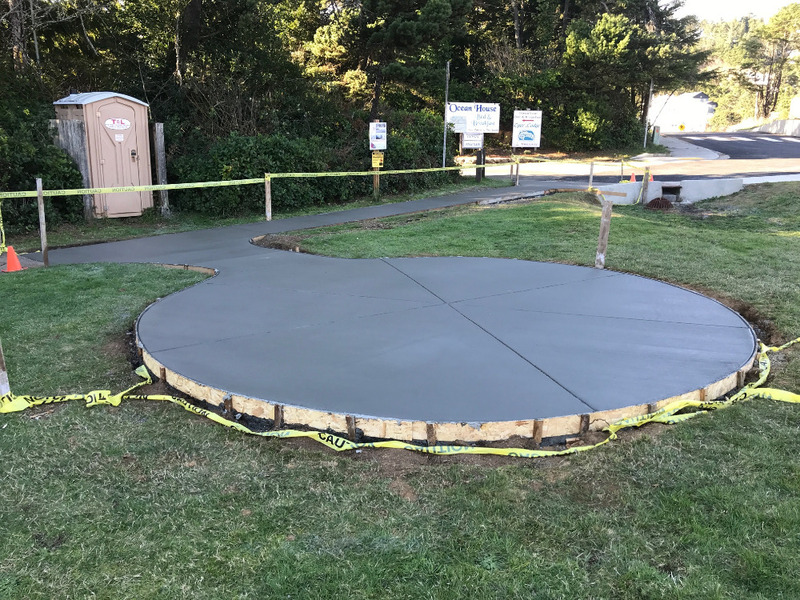 Prior to the holidays the contractor hired to pour the concrete pad for the Ernest Bloch Memorial Wayside Monument by the City of Newport completed the work. 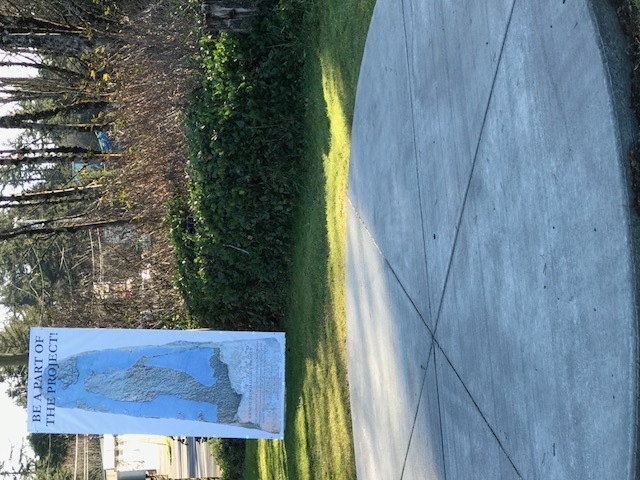 In late December Ken Spencer of Newport Signs and Frank Geltner erected a display featuring the banner created by artist Kelly Barker inviting members of the public to BE PART OF THE PROJECT. Banner erected at monument site. The concrete pad for the Ernest Bloch Memorial Wayside monument has been created thanks to the City of Newport. Work on the monument continues. Please support the "monumental" effort. 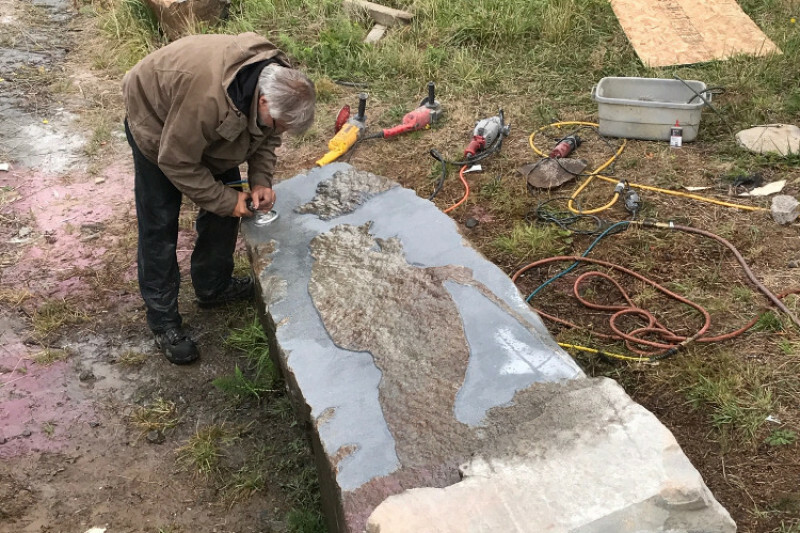 Casey Felton has prepared a short documentary on the work of Kelly Barker in creating the monument for the Ernest Bloch Memorial Wayside.